Chhattigarh MBBS Admission 2018 is based on the scores obtained in NEET. Chhattisgarh MBBS merit list has been released on 28 June, based on NEET score. A link to download the merit list of Chhattisgarh MBBS 2018 has been provided below. Aspirants included in the merit list will be called for Chhattisgarh MBBS counselling. Candidates included in the Chhattisgarh MBBS state merit rank list are eligible for counselling process. As per the preferences of courses and colleges filed by aspirants, the first Chhattisgarh MBBS counselling result will be announced on 30 June 2018. Students included in seat allotment result are required to report for document verification commencing from 2 July. Based on Chhattisgarh MBBS admission to around 1050 MBBS and 1000 BDS seats will be granted by medical and dental colleges of the state. Read the article Chhattisgarh MBBS admission 2018 application form, eligibility, merit list, counselling and more. Latest Update: Chhattisgarh MBBS Merit List 2018 has been released. Link to download Chhattisgarh MBBS state merit rank is provided below. The Chhattisgarh MBBS 2018 merit list has been released on 28 June. Aspirants can download the merit list of Chhattisgarh MBBS state merit rank 2018 from the link provided below. Candidates included in this Chhattisgarh MBBS/BDS rank list are eligible for counselling process. Chhattisgarh MBBS merit list 2018 includes the name, Chhattisgarh state rank, NEET scores and AIR. The candidate must be a domicile of Chhattisgarh and an Indian citizen. Candidate must have passed class 12 from Chhattisgarh Board of Secondary Education or from any equivalent Board approved by Chhattisgarh Board. Candidate must have attained 17 years of age by 31 December of the exam year. The candidate appearing for the CGPMT must have obtained 50% marks in Physics, Chemistry, Biology and English in the qualifying exam (Class 12 or equivalent examination). For reserved SC/ST category, 40% marks is must, and a for OBC 45%. Candidates can fill the application form from 18 to 26 June 2018. A link has been provided below to fill the Chhattisgarh MBBS application form 2018. All candidate must produce a domicile certificate that should be attached to the application form. To fill the application form follow the link given above. It is important for the candidates to fill up the details in the application form properly. All candidates must upload the signature, photograph and name thumb impression. The application fee can be paid through net-banking or bank challan the CGPMT examination. CGPMT Counselling for all the courses except BPT will be conducted online. candidates have to register online for CGPMT counselling. 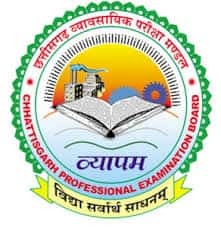 All the candidates who have qualified for CGPMT and have successfully completed the course must work in Chhattisgarh for two consecutive years as per the bond signed with the government. But in case the candidate no longer wants to serve in Chhattisgarh after the completion of his/her course, they can be relieved by paying 25 Lac for General Category and 20 Lac for the Reserved Category. Chhattisgarh Medical Admission will be done on the basis of NEET 2018. Therefore, the following exam pattern is no more valid for MBBS/BDS admissions in Chhattisgarh. Exam Syllabus: Questions will be asked from Botany, Physics, Chemistry and Zoology.